When he was a kid in Minnesota, Michael Meyer papered his walls with National Geographic maps. A Peace Corps stint in 1995 began his 20-year odyssey in China, yielding two books, true love, and a unique perspective on the world’s most populous country. 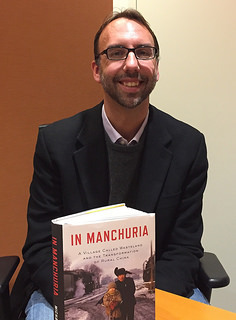 We talk about his latest book, In Manchuria: A Village Called Wasteland and the Transformation of Rural China (Bloomsbury), life in rural China compared to suburban MN, the country’s changes in the past two decades, the flexibility of the Communist party, China’s uses and abuses of history, the tortured history of the Manchuria region, the need to explode Americans’ myths about the country and its people, our favorite jet-lag remedies, and the Chinese use of “uh” as a conversational placeholder. Give it a listen! We also get into the time the Beijing police took Michael in so he could teach them American curse-words, why it’s safe to be a writer but not to be a journalist, China’s transition from individual farms to an agribusiness model, why the time to write a book is when the book you want to read doesn’t exist, the differences in storytelling modes between Americans and Chinese, his debts to Bruce Chatwin, Pearl S. Buck, and Ian Frazier, and how tens of thousands of Jews wound up in the town of Harbin. Michael Meyer is the author of the acclaimed nonfiction book The Last Days of Old Beijing: Life in the Vanishing Backstreets of a City Transformed . He first came to China in 1995 with the Peace Corps, and for over a decade has contributed from there to The New York Times, Time, the Financial Times, Los Angeles Times, Chicago Tribune, Architectural Record, Reader’s Digest, Slate, Smithsonian, This American Life and many other outlets.He is the recipient of a Whiting Writers’ Award, a Guggenheim Fellowship, and a Lowell Thomas Award for travel writing, as well as residencies at the New York Public Library’s Cullman Center for Scholars and Writers, and the Rockefeller Foundation’s Bellagio Center. He recently taught Literary Journalism at Hong Kong University’s Journalism and Media Studies Center, and wrote the foreword to The Inmost Shrine: A Photographic Odyssey of China, 1873, a collection of Scottish explorer John Thomson’s early images. He is a current member of the National Committee on United States-China Relations‘ Public Intellectuals Program, and an Assistant Professor of English at the University of Pittsburgh, where he teaches Nonfiction Writing. 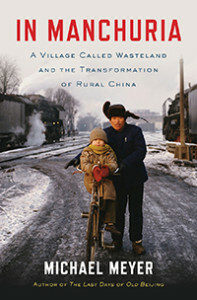 Michael’s new book, In Manchuria: A Village Called Wasteland and the Transformation of Rural China , was published by Bloomsbury in February, 2015. Credits: This episode’s music is Life in a Northern Town by Dream Academy. The conversation was recorded at the Bloomsbury offices on a pair of Blue enCORE 200 microphones feeding into a Zoom H5 digital recorder. I recorded the intro and outro on a Blue Yeti USB Microphone . Processing was done in Audacity and Logic Pro. Photo of Mr. Meyer by me.